As an NGO working in a neglected part of the world, Butoke is reliant on personal contributions and sacrifices from its own members, from the people and communities it supports, and from benefactors overseas, including individuals, non-government organizations, and official donor agencies such as CIDA and UNICEF. Butoke is fortunate to benefit from the services of Dr. Cécile de Sweemer, who is a high level professional with 50 years of experience working in developing countries, and who is donating her time and efforts and what remains of her pension after living expenses, to Butoke. Butoke’s Congolese professional staff work for modest salaries, ranging from $US75 to $US250 per month. 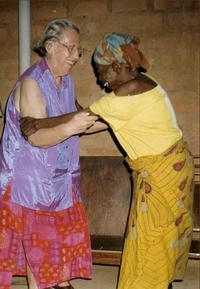 Woman dancing for joy with Cécile de Sweemer after successful cataract surgery supported by Butoke. Contributions in the US should be made through Friends of Butoke, which exists to educate people about Butoke and to raise financial support. Direct your contributions to John Mossel, 2 Penhurst Ct., Rehoboth Beach, DE 19971 (patlmossel@comcast.net). Friends of Butoke US is eligible for charitable contributions tax deductions as a public charity under section 501 (c)(3) of the US Internal Revenue Code. World Hope Canada is Butoke’s principal Canadian partner at this time, and contributions are eligible for charitable contributions tax credits. We thus request that all Canadian contributions please be directed to the address indicated in World Hope Canada’s Contacts page. Specify “for Butoke” in the memo space of your cheque. Please feel free to contact one of our goodwill ambassadors in Canada if you need more information (See Contact Us for details). LS29 9AH, United Kingdom. Friends of Butoke UK is eligible for charitable contributions tax deductions. Please feel free to Contact Us for any further Information you might need, or to discuss different options.